Ministry Ideaz: Leather vs. Leatherette – Which One Should I Get? Leather vs. Leatherette – Which One Should I Get? Leather? Or leatherette?... That is the question so many ask. Should I just get the cheapest option? Or should I pay the extra for the real thing? What are the differences between leather and leatherette? Are there advantages and disadvantages of each? In this week’s blog we’re going to take a look as this frequently asked question. Leatherette, a form of artificial leather, is much cheaper compared to leather and, unlike leather, does not fade when exposed to sunlight over an extended period. Real leather is softer and more durable than leatherette, but also significantly more expensive. However, there are many more considerations to take into account. There is nothing like the look and feel of real leather. Real leather gives an aura of luxury. When properly cared for, the premium quality leather we use on our briefcases, ministry folios and book covers becomes softer and more attractive over time, and has a distinct smell that many of the friends prefer. Because no two animal hides are exactly the same, each piece of authentic leather has unique natural characteristics. Leather also has a soft, yet strong texture, making it long-lasting. Leather is easy to take care of when maintained properly; it only needs a regular wiping with a clean, damp cloth. Please click here to learn more about the leather that we use on our briefcases and book and Bible covers. Real leather does come at a premium price compared to its counterpart. If leather is in constant sunlight, the color may fade. Leather is very porous and absorbent, so drops of liquid will quickly soak into the item if not wiped up promptly. If the leather is not protected, this can result in a stain. As it is made from animal products, real leather is a non-option for vegans. 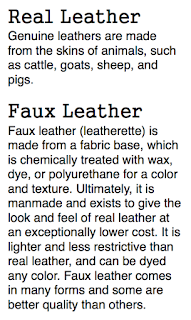 The foremost advantage of faux leather (leatherette, or synthetic leather) is that it’s cheaper than real leather. 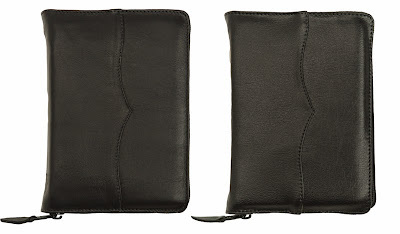 Therefore, it has a similar look and feel to genuine leather, while being much more affordable. 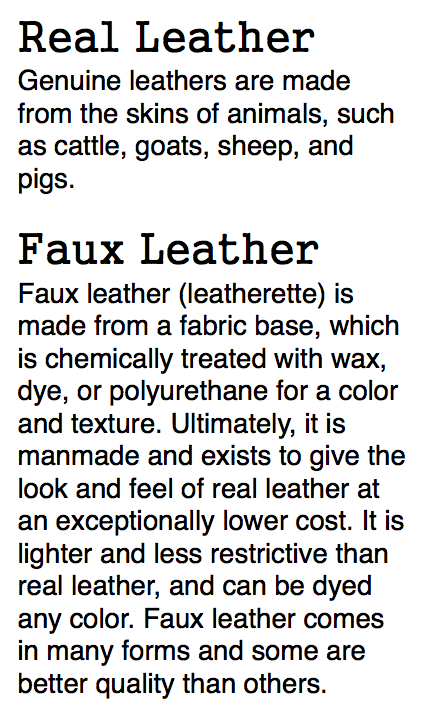 Some people prefer faux leather simply because no animals are harmed in the making of the material. Faux leather is made from a machine, which ensures that the fabric has an even, consistent color throughout. It can also be dyed into many different colors, and is less susceptible to fading in UV light. Faux leather has about a third of the life span of real leather. It cracks and splits much easier than real leather. It does not develop luster like real leather. It also smells like plastic or rubber. Because of the synthetic nature of leatherette, we are not able to use the heat process to imprint the Hebrew tetragrammaton on our leatherette products. For further information with regards to the differences between the leather and leatherette we use, please click here. 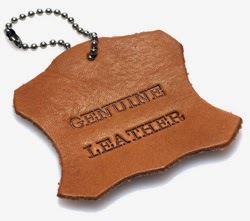 In the past, leatherette has been seen as a cheap knockoff of real leather. However, this has changed in recent years. Indeed even luxury car manufacturers such as Mercedes and BMW are now giving customers the option of high-quality leatherette upholstery. The premium leatherette that we use here at Ministry Ideaz can actually be very difficult to distinguish from real leather, at least on first glance. A close inspection, however reveals that real leather has inconsistently spaced pores, while fake leather will have perfectly even or repeating pores. 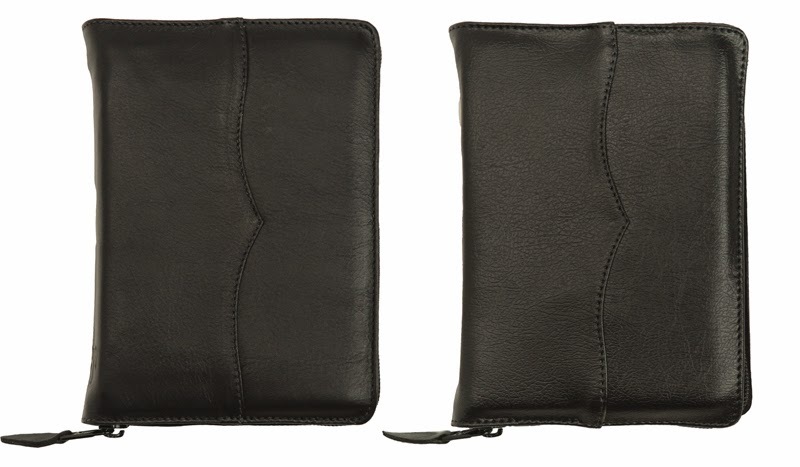 Real leather tends to have more of a buttery and supple feel, while leatherette will have a slight plastic feel. Real leather also has a very particular smell that can usually be distinguished from the imitation of synthetic leather. The most common argument against real leather is the use of animal products for nonessential luxury products. Vegan and animal rights groups routinely oppose the use of real leather in products. A counter argument to this complaint is the fact that most leather comes from cattle that were going to be slaughtered anyway. Although the production process for leather involves the use of several chemicals, it’s mostly a natural and renewable product. On the other hand, leatherette does not contain animal products (except for when left-over split leather is used as the base) and is therefore seen as an ethical alternative to leather by vegans and animal rights enthusiasts. But environmentally speaking, leatherette is a nonrenewable product based on plastics, and PVC in particular is a non-biodegradable and environmentally harmful material. How Are Leather and Leatherette Made? The production process of real leather involves three stages: preparation, tanning, and crusting. The Bible even makes mention of this trade in the account of Simon the Tanner (Acts 9:43). The preparatory stage is when the hide is unhaired, fleshed, degreased, bleached, and treated in other ways. The tanning process turns the hide into a usable material that is flexible and will not putrefy if wetted (as opposed to dried raw hide, which is stiff and will putrefy). The most common tanning material is chromium, which stabilizes the proteins. The hide is then put in a rotating float with tanning liquor until it is saturated. The crusting stage readies the leather for use, and can include softening, lubrication, coloring, buffing, and many other treatments. The manufacturing process of synthetic leather begins with a base of cloth material, which can be a synthetic polyester, or a natural material like cotton or the leftover split hide from leather production. This base is attached to a polyurethane layer that has been textured to imitate real leather. PVC-based synthetic leather can be a single layer of PVC treated with plasticizers and dyed to look like leather. Just wanted to say how much I enjoy your company! I have been a customer, on and off over the years. Always superior quality items and they last and last. I especially appreciate the very thorough description of the products. This blog article is just another example of thoroughness! Love it! Thank you so much!